The ship Bore (later Bore I) is – to out it simply – a legend. She was built in 1898 in Denmark and delivered to the company Bore in Turku (Åbo) in Finland. She served the route Turku-Mariehamn-Stockholm but was lost already in 1899 after running aground. But, Bore wouldn’t be Bore if she hadn’t been saved (from 27 meters depth) and fully restored and in service again in 1901. The vessel has transported, among many others, Lenin himself, long before the Russian revolution in 1907. In the same year this poster was published (1911) it was again time for a new accident. 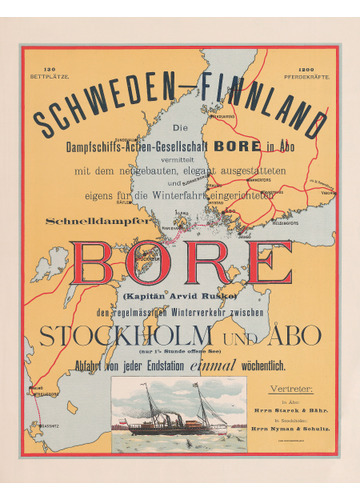 Bore ran aground in Nagu, Finland, but was fully restored again. In 1914 the Russian marine (Finland was still a part of Russia at this time) took over the vessel. After returning it for a while to Bore, the Russian state forced the company to sell it to them in 1916. 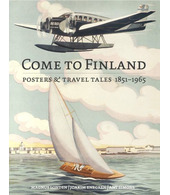 It served under its new name Grif between Helsinki and Petrograd (St Petersburg). 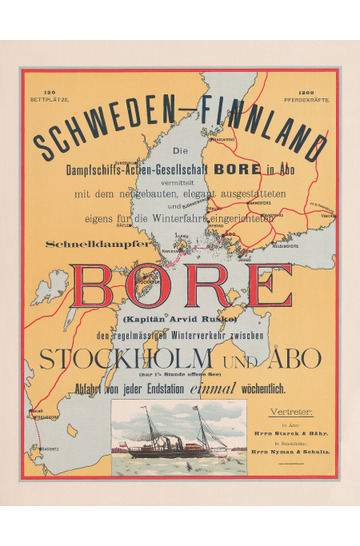 After Finnish independence in 1917 the vessel was taken over by the Finnish state and later sold to FÅA and later, in 1926, sold to the Bore company. She was home again and served the route Turku-Stockholm for many decades until finally reaching Turku one last time in September 1961. We salute her with this reprint!